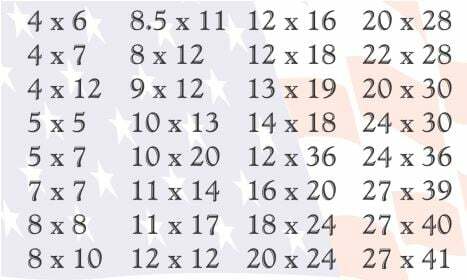 One of our most popular blog posts to date has been a post about most popular frame sizes We thought we would bring it back as we enter into the holiday season as a resource for you as you purchase picture frames. Enjoy! A listing of our standard picture frame sizes. 5×7’s are a very popular frame size because so many photographs are printed off in the 5×7 size. 5×7’s are the perfect size to display your photos on a desktop at work, home, or to give a precious memory to someone close to you. Our 8×10 picture frames are top sellers at Frame USA. Once again, 8×10 is a common picture size, but it is also a perfect frame because it includes a mat. Our 8×10 frames come with an off white mat for a 5×7 image, allowing you to mat your 5×7 picture to help highlight your memories. 8.5 x 11 frame is a popular size for documents and certificate. Check out our wide variety of specialty certificate frames or our very popular diploma series. But all of our wood frames and metal frames can be used for documents,diplomas and certificates. 11×14 frames also include an off white mat but for an 8×10 image. Many of our customers love this size because they can use the frame with the mat, or remove the mat and highlight their 11×14 photographs. Our picture frames all offer this versatility, making Frame USA’s picture frames perfect for any occasion or event. If you are looking for a medium sized picture frame, the 16×20 size is a great choice. Our 16×20 picture frames include an off white mat for an 11×14 image. This option provides just over 2” of matting on each side of your image. This is a great size picture frame because you can make it a highlight piece on your wall, or part of a mixture with other frames to form a collage on your wall. This is a great size to go with a wider picture frame such as our Verona Wide Series. Our largest popular size picture frame is our 24 x 36 size. 24 by 36 is the main size that most posters that are sold come in. Therefore if you are looking to frame a poster for a dorm room, your office or house, or to give as a gift, this is the perfect picture frame size for you. Know the size of your fine art but not sure which frame you would like to order? Purchase a sample! When choosing the best picture frame size for you, always make sure to measure your image first. All of our frame sizes are based on the inside dimensions. Therefore if you have an 8×10 image and do not want to use the mat, you still want to order an 8×10 frame. If you have an 11×14 image and do want to include a mat, it is important to order a larger frame size to accommodate this. Now the question is what is a custom size frame? 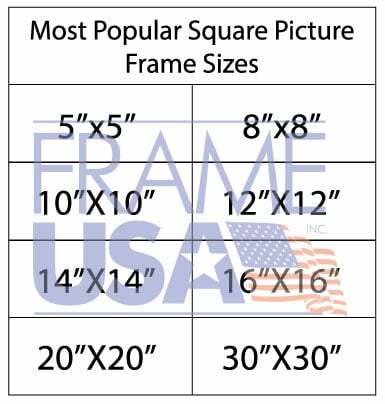 A custom size frame here at Frame USA is any size outside of our standard 32 sizes (refer to chart listed above). We can produce almost any size frame your heart can imagine. Our only limitations come into play with the width of the moulding- the thinner the frame, the smaller the maximum size will be. We hope this article on our most popular frame sizes has provided you with all of the information you may need when ordering our picture frames. If you ever have any other questions, please feel free to contact us via Email at sales@frameusa.com. We look forward to hearing from you! 5×7 is a very popular frame size because this is a common size for photographs to be printed. 5×7″ is small enough to not take up too much space, but big enough to be able to see detail in your photo or art print. This size makes for great tabletop frames and is easy to display. 8×10 picture frames are top sellers at Frame USA. Not only because it is a common picture size, but our 8×10″ frames include a mat for a 5×7 image! These mats are removable, so if you’re framing something larger you can easily remove and re-purpose the included mat. This size is especially popular for art prints because these medium sized frames can easily either be hung on a wall or displayed on a desk. It’s the perfect size for home decor. 11×14 frames also include an off white mat, but for an 8×10 image. Many of our customers love this size because they can use the frame with the mat, or remove the mat and highlight their 11×14 photographs. Our picture frames all offer this versatility, making Frame USA’s picture frames perfect for any occasion or event. Our largest popular size big picture frame is our 24×36 size. 24×36 is the main big picture frame size that most posters that are sold come in. Therefore if you are looking to frame a poster for a dorm room, your office or house, or to give as a gift, this is the perfect picture frame size for you. 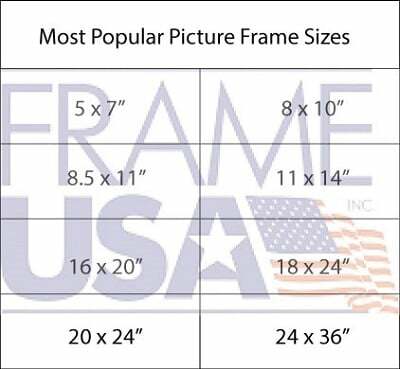 We hope this article on our most popular frame sizes has provided you with all of the information you may need when ordering our picture frames. If you ever have any other questions, please feel free to contact us via Email. We look forward to hearing from you!